Since “Announcement August”, the two super coasters of 2012 have quickly been established: Canada’s Wonderland’s Leviathan and Hersheypark’s SkyRush. Obvious comparisons make these two coasters ideal “rivals”: Bolliger & Mabillard vs Intamin, Giga-Coaster vs Mega-Coaster, giant overbanks vs airtime hills, Canada vs USA (well, perhaps not that extreme). It is certainly possible that these two coasters could each rank in the Top 20 on the planet. Which do you predict will be the better 2012 coaster? So which is more anticipated? According the most you, the readers, the undisputed winner is Leviathan. SkyRush’s innovative winged-seating, and top-ranked coaster manufacturer was unable to save it from the sheer power of the Canadian beast. Leviathan’s 306 foot drop, 90 mph top speed, and nearly mile of track are all impressive and provide for tough competition. 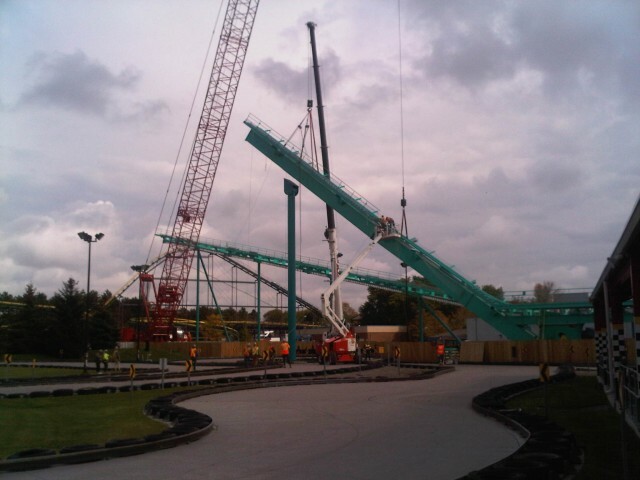 Construction on Leviathan is well underway. The ride’s lengthy brake run, as well as station and transfer track have all been erected. Construction is slowly progressing on the coaster’s 306 foot lift hill; Bolliger & Mabillard has even introduced a new type of lift track unique to Leviathan. Additionally, Canada’s Wonderland announced that two cranes will be used to install the “crowning” segment of the lift-hill. Certainly, this is a coaster to look out for! Elaborate apocalyptic setting including giant crashed airliner. Tallest with 210 ft lift hill, and 130 ft first drop. Which 2012 B&M Wing Coaster do you think will be the best? So which B&M Wing-Coaster do you think will be the best? Vote in the poll above or on the sidebar. Voting will be open for the next two weeks. swarm looks like a lame version of x-flight. wild eagle looks like a different experience. The Swarm is going to have great theming, something neither of the others offer. There is even mention of flame throwers being incorporated into The Swarm’s theming. Plus, the Swarm’s first drop will be head first towards the water. I do think X-Flight will have a stronger/more forceful layout, but the Swarm also has its own merits as well. I voted for wild eagle. It looks different from the others.